Yeah!! Mega Man, Bass, protoman and all robot masters vs the Stardroids. Timeline issues aside (MMV would definitely have been before MM8 I'd think! ), this looks great! I'll be really looking forward to this one! Hi, Matt! I'm wondering, will you guys consider releasing the cool boxed set once all three volumes are out? Hey, Matt. Not a Gigamix question but I'm wondering: any new developments on getting Iwamoto's X manga stateside? This is looking pretty awesome - I'm guessing this is meant to be a reimagining or retelling of some of the events leading up to and including Rockman World 5? Hey Mr. Matt, is there any possibility of a Philippine release? 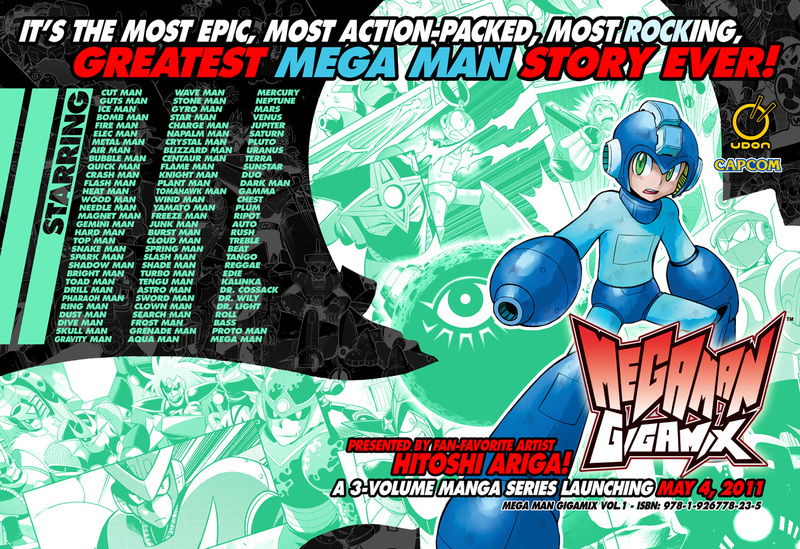 Hey Matt, a few days back they posted that Gigamix would be released in three volumes, each a little over 200 pages. This post says it will be two volumes. Which report is correct? And I second the question about MMX in the USA! @Anonymous: this exact Megamix/Gigamix boxed set is not in the plans right now. One reason is that UDON version of Megamix is spread across 3 volumes instead of 2 like the most recent Japanese release (a lot of material was cut from teh recent Japanese release). But we may come up with something similar down the road. @Major Tom: Now that Gigamix is secured, Iwamoto's X and other MM mangas are are being looked into more seriously. @ZeroX_Syaron: No official Phillipines release, but it is possible to order it from amazon, they ship pretty much worldwide. You said material was cut from the Japanese version? You mean the books we get in America will not be the same as the JPN books (shorter)? What kind of material was cut? @ JJ: So rry for any confusion. 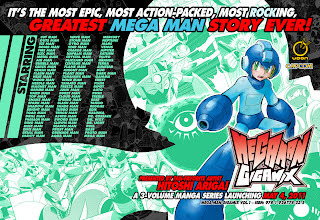 Gigamix is a 3 volume series. Vol.1 is sort of a prelude to the main story. Vol.2-3 are the 2-part main story. @ Hypercoyote: Relating to cut material, I was referring to the already-released Megamix, not Gigamix. UDON licensed Megamix from Japanese publisher Enterbrain as 3 volumes. Later, the Japanese rights to Megamix transfered to a company called Wedge. Wedge decided to republish Megamix in two volumes, cutting out much of the bonus content (comedy strips, character profiles, some short stories). UDON went ahead and still published it as 3 volumes with all the bonus content intact, so in actuality the current English version of Megamix is more complete than the current Japanese version. Gigamix however, will be very near identical to the Japanese version (actually Ariga-san may also give us a few small extras ;).